There’s an old joke that eternity can be defined as two people and a ham. Now I can attest to an alternative: two people and a turkey. With the brood departing after the holiday weekend and not taking anything with them, there was a passel of left-behinds. A little of this and that and a mound of meat. The carcass had already been cooked down into golden, flavorful stock that made its way into turkey potpie, turkey soup with rice and vegetables, turkey chili. The white meat had been scavenged for sandwiches and salads, and then, finally, all that was left was a small bowl of scraps. 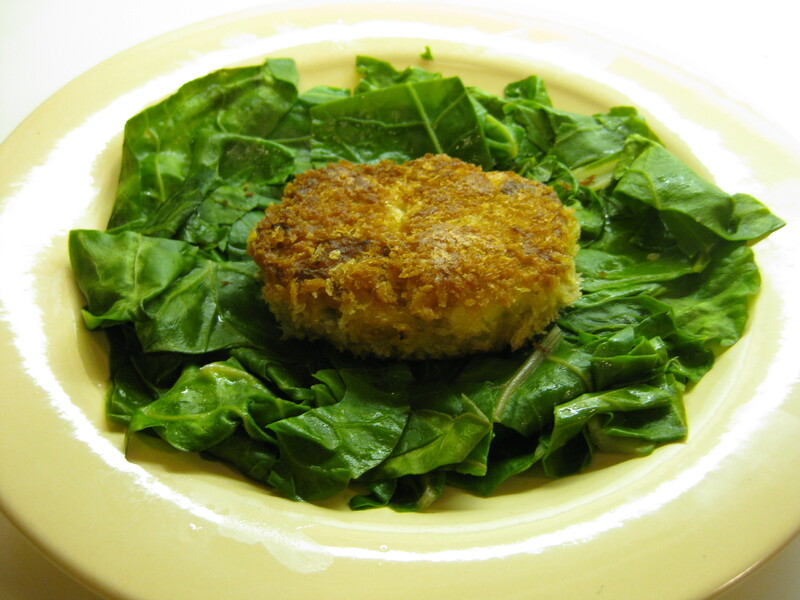 When ready to cook, dip the patties in flour, then in a beaten egg, and finally in panko or bread crumbs. Fry in vegetable oil (1/8-1/4 inch in pan) until well browned, and serve hot.Makes about 4 patties, more or less depending on how large you want them. Mine were 2 x 3 x 1/2 inches.